.Jam-Free performance in high speed with most skilled eighteen potential unit conductor drills with lithium-ion battery technology. SKU: 48-89-9206 Categories: Product Categories, CUTTING TOOLS, BITS, ANNULAR CUTTERS Tags: BIT, STEP, STEP BIT, STEP BIT 3/8" & 1/2"
Milwaukee® Step Drill Bits with JAM-FREE performance feature a dual-flute style delivering up to 2X quicker hole times, up to 4X longer life and up to fiftieth a lot of holes per battery charge than the competition. Ideal for drilling massive and small-diameter holes in steel and plastic, these bits are Optimized for conductor drills in high speed. The speedy Strike™ tip permits for quick, correct starts that generate less heat, leading to longer bit tip life. Black compound coating additionally enhances sturdiness, hole quality and bit life.For user convenience and accuracy, every bit has laser-engraved reference marks you’ll see whereas drilling. 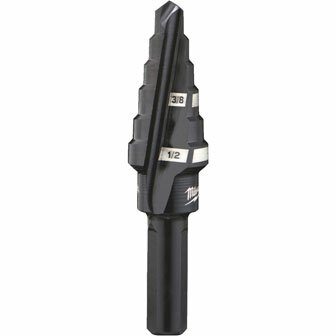 The 3-flat Secure-Grip™ shank ensures a solid reference to the drill chuck. The #6 Step drilling bit has two hole sizes: 3/8″ and 1/2″.Jam-Free performance in high speed with most skilled eighteen potential unit conductor drills with lithium-ion battery technology.